Big news, what’s going on here? Lately it’s been a bit too quiet around Flattr. But that’s just because we’ve had so much stuff to do! The things that have been happening, have done so behind the scenes, kinda. Firstly, the money calculation – we’ve been playing and tweaking with it. It’s almost perfect now, and we’ve been trying and testing. That’s why this is a beta, to be able to make sure that the whole system works flawlessly. This week the money will end up in peoples Flattr balance! And why this week? 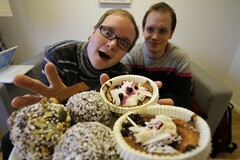 Well, since we released the beta people have been very interested in Flattr and gone bananas. We didn’t expect that to happen really so we where a bit unprepared. We got invited to meet a lot of people for various reasons – a lot of sites wanted to use Flattr, a lot of people wanted invites, and what happened is that a lot of people wanted to help us out, in numerous ways. One of these ways is that we found a partner that actually had something we lacked – money! And we liked the people so much that we decided to accept! So yes, we got some seed capital! We’re not gonna tell you from whom yet, since we like to mess with people a bit. But they are in this for more than money, which was one of the reasons why we accepted. So the past weeks we’ve been hunting programmers, designers, an office, chairs for the office and bla bla bla! Tomorrow (Monday) we’re moving into the new office, with our new team! We’re now a total of six people in the team, which is just amazing! Here’s a picture from the office, which is located in central Malmö. Peter is also appearing later tonight on South By South West to talk about the internets, in English, and it will probably be live casted. More info on Flattr might be revealed there! Congrats! Keep up the good work! The innovative region of the Øresund leads the bright future of Sweden and the Internet! You guys are fiery awesome rockstars! Keep up the good work! Congrats ! But you really have to move quickly if you want this idea to get some steam. Oh, and also : give me invite or give me cake ! I want to give money to artists/coders ! Next Next post: The ticket queue is full of 2dos! We’ve officially launched in the US!